Surrey County Cricket Club is one of eighteen first-class county clubs within the domestic cricket structure of England and Wales. It represents the historic county of Surrey and also South London. The club's limited overs team is called "Surrey" (unlike most other counties' teams, it has no official nickname). The club was founded in 1845 but teams representing the county have played top-class cricket since the early 18th century and the club has always held first-class status. Surrey have competed in the County Championship since the official start of the competition in 1890 and have played in every top-level domestic cricket competition in England. Home of the club since its foundation in 1845 has been The Oval (currently known officially as the 'Kia Oval' following a sponsorship deal with the Kia Motors company), in the Kennington area of Lambeth in South London. The club also has an 'out ground' at Woodbridge Road, Guildford, where some home games are played each season. Surrey have had three notable periods of great success in their history. The club was unofficially proclaimed as "Champion County" seven times during the 1850s; it won the title eight times from 1887 to 1895 (including the first ever officially constituted County Championship in 1890); and seven consecutive outright titles from 1952 to 1958 inclusive following a shared title (with Lancashire) in 1950. In 1955, Surrey won 23 of its 28 county matches, a record that still stands and can no longer be bettered as counties have played fewer than 23 matches each season since 1993. To date, Surrey has won the official County Championship 19 times outright (and shared once), more than any other county with the exception of Yorkshire, with the most recent win being 2018. The club's traditional badge is the Prince of Wales's feathers. In 1915, Lord Rosebery obtained permission to use this symbol from the Prince of Wales, hereditary owner of the land on which The Oval stands. For more information about cricket in Surrey before the formation of Surrey CCC, see History of cricket to 1725 and Surrey county cricket teams. It is widely believed that cricket was invented by children living on the Weald in Saxon or Norman times and that the game very soon reached neighbouring Surrey. Although not the game's birthplace, Surrey does claim the honour of being the location of its first definite mention in print. Evidence from a January 1597 (Julian calendar - 1598 in the Gregorian calendar) court case confirms that creckett was played by schoolboys on a certain plot of land in Guildford around 1550. In 1611, King James I gave to his eldest son, Henry, Prince of Wales, the manors of Kennington and Vauxhall, where the home ground of Surrey – The Oval – is today. To this day, the Prince of Wales's feathers feature on the cricket club's badge. Cricket became well established in Surrey during the 17th century and the earliest village matches took place before the English Civil War. It is believed that the earliest county teams were formed in the aftermath of the Restoration in 1660. The earliest known first-class match in Surrey was Croydon v London at Croydon on 1 July 1707. In 1709, the earliest known inter-county match took place between Kent and Surrey at Dartford Brent with £50 at stake. Surrey would continue to play cricket against other representative teams from that time onwards. Probably its greatest players during the underarm era were the famous bowler Lumpy Stevens and the wicket-keeper/batsman William Yalden, who both belonged to the Chertsey club. Surrey CCC was founded on the evening of 22 August 1845 at the Horns Tavern in Kennington, South London, where around 100 representatives of various cricket clubs in Surrey agreed a motion put by William Denison (the club's first secretary) "that a Surrey club be now formed". A further meeting at the Tavern on 18 October 1845 formally constituted the club, appointed officers and began enrolling members. A lease on Kennington Oval, a former market garden, was obtained by a Mr Houghton from the Duchy of Cornwall. Mr Houghton was of the old Montpelier Cricket Club, 70 members of which formed the nucleus of the new Surrey County club. The Honourable Fred Ponsonby, later the Earl of Bessborough was the first vice-president. Surrey's inaugural first-class match was against the MCC at The Oval at the end of May, 1846. The club's first inter-county match, against Kent, was held at The Oval the following month and Surrey emerged victorious by ten wickets. However, the club did not do well that year, despite the extra public attractions at The Oval of a Walking Match and a Poultry Show. By the start of the 1847 season the club was £70 in debt and there was a motion to close. Ponsonby proposed that 6 life members be created for a fee of £12 each. His motion was duly passed, and the club survived. The threat of construction on The Oval was also successfully dispelled in 1848 thanks to the intervention of Prince Albert. In 1854, Surrey secured a new 21-year lease on their home ground and Surrey went on to enjoy an exceptionally successful decade. being “Champion County” seven times from 1850 to 1859 and again in 1864. In 1857, all nine matches played by the county resulted in victory. This was the time of great players like William Caffyn, Julius Caesar, HH Stephenson and Tom Lockyer, and a fine captain in Frederick Miller. An incident in 1862, at the instigation of Edgar Willsher in a match between Surrey and England, led to the introduction of overarm bowling into cricket. Following a brilliant season in 1864 when the team won eight and drew three of its eleven first-class matches, Surrey went into free-fall in the latter half of the 1860s, owing to the decline of key players Caesar, Stephenson and Mortlock and a puzzling inability to find quality bowlers to support the incomparable James Southerton, whose combination with wicket-keeper Ted Pooley virtually carried the team. Although Southerton broke many bowling records and Harry Jupp developed into the most prolific scorer among professional batsmen, Surrey’s record in purely county matches during the seventeen seasons from 1866 to 1882 was 59 victories, 107 losses, two ties and 37 drawn games. The team bottomed out in 1871 when they did not win a single county match for the only time until 2008. Southerton, except in 1872 when fast bowler James Street helped him to win seven of twelve games, had no adequate support in bowling after underarm left-arm spinner George Griffith declined, and except when Richard Humphrey achieved prominence in 1872 the batting depended almost entirely on Jupp. The fielding was also generally below the standard expected of first-class cricket. The appointment of renowned sports administrator Charles Alcock as secretary of the club – a paid position for the first time – in 1872 coincided with an improved performance, but despite qualification rules being changed so that Southerton played every game for the county (up to 1872 he did not play whenever Sussex, the county of his birth, had a match on) Surrey declined to a lowly record in 1873. As mainstays Jupp and Southerton declined from 1875, matters were ameliorated by the discovery of class amateur batsmen in Bunny Lucas, Walter Read and William Game, but apart from 1877 Surrey never won half as many games as they lost and the inadequacy of the bowling on flat Oval pitches was a severe handicap. In 1880, although the county’s record remained bad, Surrey began to make the steps that would return them to the top of the table with the appointment of John Shuter as captain and of Walter Read – established as a class batsman but previously available only in August – as assistant secretary. The death of Southerton and retirement of other veterans paved the way for new talent in Maurice Read, William Roller, left-arm spinner Edward Barratt and pace bowler Charles Horner to lay a foundation for long-term success in the middle 1880s. With the rapid rise of George Lohmann in 1885, Surrey challenged for the unofficial title of Champion County for the first time in twenty years; then, by winning 32 of 42 matches in 1887, 1888 and 1889, Surrey were first or equal first in the final three years before official County Champions emerged. Surrey then won official County Championship titles in 1890–1892 under John Shuter. After a disappointing season in 1893 when their batting failed on Oval pitches rendered fiery by several dry winters and springs, Kingsmill Key took over and led Surrey to further titles in 1894, 1895 and 1899. Leading players in these years were batsman Bobby Abel and a trio of top bowlers: George Lohmann, Bill Lockwood and Tom Richardson. In 1899, Abel's unbeaten 357 helped Surrey to a mammoth total of 811 against Somerset; both scores remain club records over 100 years later. The start of the 20th century brought a decline in Surrey's fortunes, and they won the title only once during the next fifty years, in 1914. At the request of Surrey's captain Lord Dalmeny, the Prince of Wales (later Edward VIII) allowed the use of his feathers on the club badge. The club's most famous player was Jack Hobbs, who began playing for the county in 1905, and he had a notable opening partner till 1914 in Tom Hayward, who scored 3,518 runs in all first-class cricket in 1906, equalled C.B. Fry's record of 13 centuries in a season and, in one six-day period, scored two centuries at Trent Bridge and two more at Leicester. He scored his hundredth hundred at The Oval in 1913. Between the two World Wars, Surrey often had a good side, but it tended to be stronger in batting than in bowling; Hobbs played until 1934 with another good opening partner in Andrew Sandham. Hobbs scored more runs (61,760) and compiled more centuries (199) in first-class cricket than any other player in the history of the game. In recognition of his contribution to the team, the eponymous Jack Hobbs Gates were inaugurated at The Oval. The side was not completely bereft of quality in the bowling department, however: Alf Gover took 200 wickets in both 1936 and 1937, a fine achievement for a fast bowler on the flat Oval track. The Oval pitches of this period tended to be very good for batting, and many matches were drawn. The club captain for much of this period was the affable and bohemian Percy Fender, whose closest colleague was the England captain of Bodyline fame (or infamy), Douglas Jardine. In 1938, Surrey played a home match away from The Oval for the first time, at Woodbridge Road in Guildford. After 1939, cricket took a break as the Second World War occupied the nation and The Oval was seized for Government use. From 1948 to 1959, Surrey were the pre-eminent English county team, finishing either first or second in the county championship in 10 seasons out of 12. They finished runners-up in 1948, shared the championship with Lancashire in 1950, won seven consecutive outright titles from 1952 to 1958, and were runners-up again in 1959. Their margins of victory were usually large. For example, Yorkshire were runners-up in 1952 but finished 32 points behind. Their great success was built on a remarkably strong bowling attack, with Test seamer Alec Bedser supported by the outstanding spin duo of Tony Lock and Jim Laker, the latter widely regarded as one of the finest ever orthodox off-spinners. Lock and Laker made the most of Oval pitches, which were receptive to spin, but the club's success was also due to the positive and attacking captaincy of Stuart Surridge, who won the title in all five years of his leadership from 1952 to 1956. The team fielded extremely well and a feature was some brilliant close catching. The team had excellent batsmen, especially the elegant Peter May, and the determined and combative Ken Barrington. Over the next forty years to 1998, Surrey won the County Championship only once, in 1971 during the career of England opener John Edrich and under the captaincy of Micky Stewart, but more success was achieved in the shorter form of the game. In 1969, Surrey employed their very first overseas player: the very popular Pakistani leg break bowler Intikhab Alam. In addition to Intikhab, the Surrey attack in their Championship-winning side possessed four current or future England Test cricketers in Geoff Arnold, Robin Jackman, Bob Willis and Pat Pocock. Edrich was subsequently appointed captain in 1973 and led Surrey to second position in the County Championship in his first year in charge and then secured Surrey their first limited overs silverware the following year with victory in the Benson and Hedges Cup. Edrich's replacement as captain, Roger Knight, led Surrey to NatWest Trophy glory at Lord's in 1982. Following Intikhab Alam, other overseas players to appear for the county included the talented New Zealand opening batsman Geoff Howarth and two very fearsome fast bowlers, the West Indian Sylvester Clarke and the Pakistani Waqar Younis. Following a relative drought of first-class success, and with growing concern over the club's internal structure, the club's members forced a Special General Meeting in 1995. Following the resultant internal restructuring, a change of fortunes soon followed as new captain Alec Stewart – son of Micky – led the team to the Sunday League title in 1996. This in turn proved to be the catalyst for further success under the captaincy of Adam Hollioake and the influence of Keith Medlycott, who was county coach from 1997 to 2003. County Championship triumphs in 1999, 2000 and 2002 were complemented with Benson and Hedges Cup victories in 1997 and 2001, a National League Division Two title in 2000 and the inaugural Twenty20 Cup in 2003. This was in spite of the death of the highly talented all-rounder Ben Hollioake, Adam Hollioake's younger brother, who was involved in a fatal car accident in early 2002. That same year, Ali Brown posted what remains today a world record List A score of 268 against Glamorgan at The Oval, beating Graeme Pollock's former records score in the first of his two one-day double hundreds for Surrey. Adam Hollioake retired after the 2004 season. Current player Jade Dernbach runs up to bowl against Sussex at the County Ground in Hove in the 2008 Twenty20 Cup. The run of success came to an end in 2005 when an ageing Surrey team was relegated to Division Two of the Championship, but an immediate recovery took place in 2006 as Surrey won promotion as champions of Division Two. This proved short-lived however, and they were once again relegated to Division Two in 2008, failing to win a single game for the first time since 1871 and losing their last two games by an innings. Despite the end of a successful period, Surrey did post a List A world record score of 496–4 from 50 overs, the first of which was a maiden, against Gloucestershire at The Oval on 29 April 2007; Ali Brown top scored with 176 from just 97 deliveries. The 2000s saw the retirement of Alec Stewart, Mark Butcher, Graham Thorpe and Martin Bicknell, who all represented England, as well as Saqlain Mushtaq who played for Pakistan. 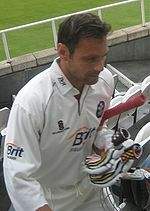 Another England player in Mark Ramprakash had joined Surrey in 2001 and, despite the club's travails, became the nineteenth player to pass 15,000 first-class runs for the county, doing so at an average of over 70. Surrey did not threaten to achieve a return to Division One of the County Championship after their relegation, or to win either 40-over competition until 2011. However, the club did have more luck in the Twenty20 Cup following victory in 2003, reaching finals day in 2004, 2005 and 2006, but failing to win the competition. 2011 saw a revival in the team's fortunes. They achieved a return to Division One of the County Championship by the margin of a single point, as they won their final four games of the season. They also won the CB40 competition. After narrowly avoiding relegation in 2012 (a season greatly overshadowed by the sad death of talented young batsman Tom Maynard in June), Surrey finished bottom of the Division One table the following year, and the Cricket Manager, Chris Adams, was sacked during the course of the season. Under the new management team of Alec Stewart, appointed Director of Cricket, and Graham Ford, recruited before the 2014 season to be Head Coach, they won the Division Two title in 2015 and were also beaten finalists in the Royal London Cup. In January 2016 it was announced that Ford had left to rejoin Sri Lanka as head coach. Michael Di Venuto took over as Head Coach for the 2016 season and after a poor start, with Surrey bottom of Division One after seven games, the team had a strong finish to the season, finishing in the middle of the Championship and again runners-up in the Royal London Cup. The 2018 season saw Surrey dominate the Championship, winning the title with two matches remaining. Surrey's badge has featured the Prince of Wales's feathers since 1915, when Lord Rosebery successfully requested permission for their use. Surrey's historical link to the Prince of Wales dates back to the birth of the club, which was only made possible by the agreement of the then Prince of Wales to allow his tenants at Kennington Oval to sub-let the ground for the purposes of cricket. The club's official colour is chocolate brown. In first-class cricket, Surrey traditionally wear a brown cricket cap along with their cricket whites. Batsmen wear a brown helmet. The first-class kit and the kit worn in the NatWest t20 Blast and Royal London One-Day Cup competitions are currently manufactured by the Adidas sportswear brand, whilst the logo of club sponsors Kia Motors appears across the front of the shirt. In common with all other counties, Surrey's one-day sides have worn a variety of different coloured kits over the years. Currently, they wear predominantly black shirts with 'fluro blue' decoration. This replaced the 40-over black shirts with 'fluro green' piping and white patches and the T20 'fluro green' and black designs of 2010 and 2011. The limited overs teams were called Surrey Lions before a name change for the 2006 season to Surrey Brown Caps, but another switch saw them revert to Surrey Lions. From 2012 onwards, they dropped the "Lions" and were called simply Surrey. The side wore navy blue and sky blue in 2004 in both forms of the limited overs game and stuck with these colours in 2005. 2007 saw the light blue replaced by Surrey's traditional brown in the 40-over game, before the darker shade of blue turned to gold in 2008 to produce a brown and gold combination, while brown and silver were preferred for Twenty20 contests. White, red and sky blue were worn by the side around the start of the 21st century. Since their formation, Surrey have played the overwhelming majority of their home matches at The Oval. It currently holds 25,500 people and is the third largest cricket ground in England, after Edgbaston's recent expansion in capacity. The Oval was first leased by the club in 1845 from the Duchy of Cornwall and it remains so to this day. The ground has hosted Surrey matches since its opening and it staged all but two Surrey home matches between 1846 and 1938. By tradition, The Oval generally holds the last Test Match of each English summer, in either late August or early September. Surrey also play at Woodbridge Road, Guildford, which holds 4,500 spectators. This is known as an 'out-ground' and currently hosts one County Championship match and one List A match each season. All other home matches are played at The Oval. Surrey contest the London Derby with Middlesex, so-called because of the two traditional counties' proximity to, and overlap with, today's Greater London, which was only created in 1965. The match generally draws the biggest crowds of the season for either team. In first-class cricket, Surrey have won more of the 256 London derbies than Middlesex, but the commonest result is the draw, while Middlesex have the slight edge in one-day cricket with 28 wins to Surrey's 26. Surrey have won 11 of the 16 Twenty20 London derbies. Surrey County Cricket Club traditionally has relatively strong finances in terms of the county game (whose 18 counties' aggregate losses amounted to over £9 million in 2010), which is in no small part due to the capability of and agreement with its principal home ground, The Oval, to stage Test cricket on a yearly basis, alongside limited overs internationals. However, despite its reputation as an aggressively commercial club, this reputation took a hit with the club announcing pre-tax losses of £502,000 for the 2010 financial year, as turnover dropped by 20% to £20.5m. The club had previously benefited from a sunnier balance sheet due to the sale of ground naming rights and the re-development of the Vauxhall End at The Oval. In the 2008 financial year, a year when the Club did not win a single match in the Second Division Championship, Surrey had achieved pre-tax profits of £583,000 with a turnover of approaching £24 million, as membership swelled to 10,113. Record profit and turnover were announced for 2009 thanks to the staging of international cricket matches with the figures growing to £752,000 and £25.5 million, respectively. Surrey have maintained a number of relationship with sponsors over the years. The most prominent currently are Korean car manufacturer Kia Motors and kit manufacturers Adidas. Kia holds a shirt and ground sponsorship agreement with the club at the value of £3.5m over five years, which represents some improvement on the £250,000 received from Australian financial corporation AMP Limited and the £1,500,000-a-year deal with Brit plc that followed. The club also holds arrangements with various other partners, such as Marston's Pedigree and BBC London 94.9. ^ Prior to 1989, no naming rights were attached to The Oval and it was called Kennington Oval. As of 12 January 2019. The following cricketers have made 200 or more appearances for Surrey in first-class, List A and Twenty20 cricket combined. For a complete list of officially appointed Surrey captains, see List of Surrey cricket captains. Surrey have had 40 club captains since 1846. The club captain leads the team on the field, unless he is on international duty, injured or otherwise unavailable. Surrey's most successful County Championship captain is Stuart Surridge, who won the title in each year of his captaincy in a five-year run stretching from 1952 to 1956. The current captain is Rory Burns. For the 2018 season onwards, the club announced the creation of a separate captain specifically for Twenty20 matches, with Jade Dernbach being appointed to the role. This list excludes those who are also listed above as notable players. Data is primarily taken from Surrey Yearbooks. For a list of Surrey's Presidents, see List of Presidents of Surrey CCC. The position of President is an honorary one. The President does not take a salary and is chosen from supporters of the club. Past holders of the seat have included former Prime Minister Sir John Major and a number of former players, an example of which is the 2011 President and 1960s Surrey slow left-arm bowler Roger Harman, who held the post for a single year, as has been customary in recent years. He was the 48th President. The Chief Executive of Surrey CCC is the official who is in charge of the day-to-day running of the club. The position had formerly been called Secretary, but was changed in 1993. Current Chief Executive Richard Gould joined the club in 2011 after a six-year tenure at Somerset CCC. Previous incumbent Paul Sheldon was in the job for 16 years and oversaw the construction of the OCS Stand during his time at The Oval. The manager's role became vacant following the sacking of Chris Adams on 17 June 2013. The first team coach, Ian Salisbury, was also sacked. Adams had held the position since his appointment in 2008 after the sacking of Alan Butcher, who had been promoted from assistant in 2006 at a time when his son Mark was club captain. Micky Stewart, who also played for the club, had been the cricket manager from 1979 to 1986. It was announced that following the sacking of Adams Alec Stewart would take charge of first team affairs until a long term successor was found, with the bowling coach Stuart Barnes as his assistant. In October 2013 the club announced that Graham Ford would become head coach in February 2014, with Stewart becoming Director of Cricket, a new position. In early 2016, Graham Ford resigned as head coach, and Surrey subsequently appointed Michael Di Venuto. Former England fast bowler Ryan Sidebottom was appointed bowling consultant on 14 March 2018. The club's current scorer is Phil Makepeace, who succeeded the long-serving Keith Booth. For a list of Surrey's first-class cricket records, see List of Surrey first-class cricket records. For a list of Surrey's List A cricket records, see List of Surrey List A cricket records. For a list of Surrey's Twenty20 cricket records, see List of Surrey Twenty20 cricket records. ^ Wisden Cricketers' Almanack, 1993 edition, obituary of Stuart Surridge. ^ a b Williamson, Martin. "A brief history of Surrey". Cricinfo.com. Retrieved 8 August 2011. ^ Altham (1962), ch. 1. ^ a b c d e f g h i "The History of Surrey County Cricket Club" (PDF). Kiaoval.com. Retrieved 8 August 2011. ^ "Scorecard of Surrey's first match". Cricketarchive.com. Retrieved 8 August 2011. ^ "Scorecard of Surrey's first inter-county match". Cricketarchive.com. Retrieved 8 August 2011. ^ Lemmon (1989), pp. 14–19. ^ "Highest Team Totals for Surrey". Cricketarchive.com. Retrieved 6 August 2011. ^ "Most Runs in an Innings for Surrey". Cricketarchive.com. Retrieved 6 August 2011. ^ "RECORDS / FIRST-CLASS MATCHES / BATTING RECORDS / MOST RUNS IN CAREER". Espncricinfo.com. Retrieved 8 June 2018. ^ "RECORDS / FIRST-CLASS MATCHES / BATTING RECORDS / MOST HUNDREDS IN A CAREER". Espncricinfo.com. Retrieved 8 June 2018. ^ "Ojha seals Surrey's promotion". Espncricinfo.com. 14 September 2011. ^ "Cricketer Tom Maynard dies after being hit by London Underground train". BBC News. Retrieved 28 Sep 2015. ^ "Di Venuto joins Surrey as head coach". Espncricinfo.com. ESPNcricinfo. Retrieved 19 September 2016. ^ "Trott leads canter to trophy after Surrey's collapse". ESPNcricinfo. Retrieved 19 September 2016. ^ "2011 SCCC Replica Kit". Kiaoval.com. Retrieved 9 August 2011. ^ "Surrey Lions set for second coming". Ecb.co.uk. 12 February 2010. Retrieved 8 August 2011. ^ Upal, Sunni (7 July 2011). "Fixture list chaos is unacceptable: Sunni Upal". Thecricketer.com. ^ Conn, David (19 September 2007). "Counties warm to salary-cap idea as gap widens between haves and have-nots". Guardian.co.uk. London. Retrieved 8 August 2011. ^ "County cricket faces financial woes". Bbc.co.uk. 8 April 2011. Retrieved 10 August 2011. ^ "Surrey announce pre-tax loss". Cricinfo.com. 15 March 2011. Retrieved 10 August 2011. ^ "Surrey announces pre-tax profit". Cricinfo.com. 14 April 2009. Retrieved 10 August 2011. ^ "Surrey announce record profit". Cricinfo.com. 22 March 2010. Retrieved 10 August 2011. ^ a b c "Kia Announced as Lead Sponsor of Surrey County Cricket Club". Kiaoval.com. 2 December 2010. Retrieved 10 August 2011. ^ a b "Surrey Cricket hunts shirt sponsor after AMP drops out". Marketingweek.co.uk. 6 February 2003. Retrieved 10 August 2011. ^ "Surrey secure record sponsorship deal". The Guardian. London. 26 January 2004. Retrieved 10 August 2011. ^ "Current Sponsors & Partners". Kiaoval.com. Retrieved 10 August 2011. ^ a b c d "The Kia Oval, Kennington". Cricketarchive.com. Retrieved 10 August 2011. ^ "Computacenter step down as Main Club". Kiaoval.com. 7 January 2002. Retrieved 10 August 2011. ^ "Surrey announce sponsorship deal". Kiaoval.com. 13 June 2003. Retrieved 10 August 2011. ^ "Since 1867". Surridgesport.co.uk. Retrieved 10 August 2011. ^ "New Under Armour T20 kit launched". Surrey County Cricket Club. Retrieved 28 January 2015. ^ "Squad". Kiaoval.com. Retrieved 12 January 2019. ^ "Somerset chief executive Richard Gould joins Surrey". The Guardian. London. 7 March 2011. Retrieved 13 August 2011. ^ Bolton, Paul (24 February 2011). "Somerset chief executive Richard Gould joins Surrey". Daily Telegraph. London. Retrieved 13 August 2011. ^ Bolton, Paul (17 June 2013). "Surrey sack team director Chris Adams and coach Ian Salisbury with Alec Stewart taking over". Telegraph.co.uk. Retrieved 29 September 2018. ^ "Ryan Sidebottom: Former England bowler joins Surrey as a bowling consultant". Bbc.co.uk. 14 March 2018. Retrieved 29 September 2018. Altham, Harry (1962). A History of Cricket, Volume 1 (to 1914). George Allen & Unwin. Birley, Derek (1999). A Social History of English Cricket. Aurum Press Ltd. ISBN 1-85410-941-3. Bowen, Rowland (1970). Cricket: A History of its Growth and Development. Eyre & S. ISBN 0-413-27860-3. Lemmon, David (1989). The History of Surrey County Cricket Club. Christopher Helm Publishers Ltd. ISBN 0-7470-2010-8. Lillywhite, Fred (1862). Cricket Scores and Biographies of Celebrated Cricketers: 1841–1848 v. 3. Roger Heavens. ISBN 1-900592-25-8. Ross, Gordon (1971). A History of County Cricket: Surrey. Arthur Barker Ltd. ISBN 0-213-00390-2. Surrey County Cricket Club First-Class Records 1846–2000, Limited Overs Records 1963–2000. Surrey CCC.